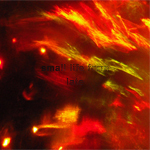 Small Life Form returns for Christmas with an EP of electroacoustics & cheap synths built into sonic walls. The first two pieces (“Days Late” & “A Ride Home”) are built from a concept Small Life Form has been trying to bring to fruition for four years, using an optical theremin & Christmas tree lights. Why did it take four years? Because the Christmas tree lights were making the theremin make an unpleasantly high-pitched noise & it took a long time to figure out how to change that. In the end the answer was putting pieces of a broken beer bottle over the optical sensor. “Days Late” takes the theremin & layers on cheap synths to make a piece typical of the Small Life Form live set while “A Ride Home” takes just the theremin & slows it down as something to something meditative. “A Request from Dad” is a piece written at the request of Bryce Eiman for 919Noise’s Christmas Showcase based on some recent shows featuring music boxes & the only sound sources are music boxes run through SLF’s standard effect rig. So sit back & let the aggressive ambient ring in your holidays.